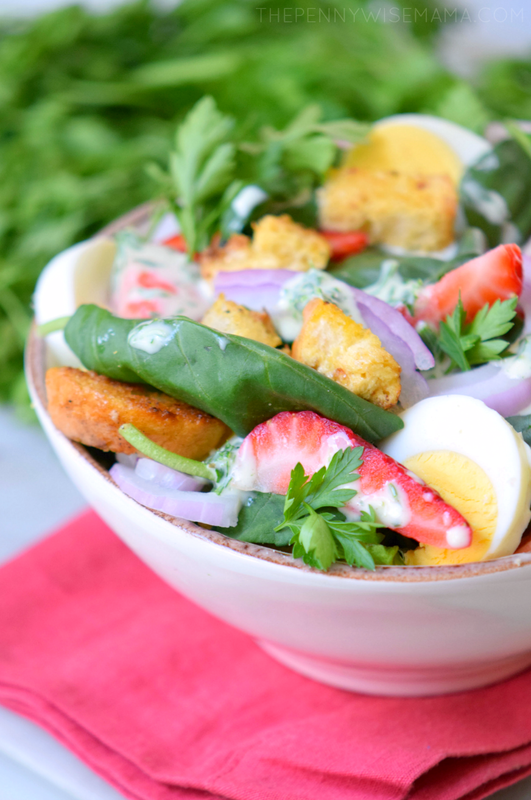 This Strawberry Spinach Salad featuring homemade Greek yogurt dressing is not only delicious and packed full of flavor, it’s also healthy and super filling. I love pretty much all kinds of salads but I tend to get bored with them. This salad is everything but boring! It’s packed full of so many delicious flavors and the dressing alone is something that I could pretty much eat with a spoon. I know it may seem weird to put strawberries on your salad, but seriously, they are a game changer. 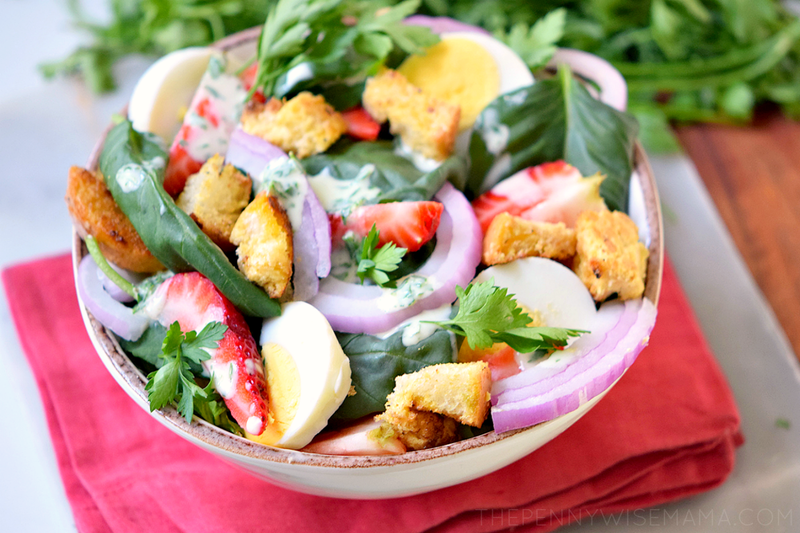 They give the salad a hint of sweetness that offsets the more bitter, salty flavors found in the spinach, red onions and hardboiled eggs. And the best part is the dressing is homemade, so it’s much healthier than the store-bought varieties that are heavy and loaded with fats. It’s made with a secret ingredient — Greek yogurt!! I know what you are thinking — yogurt as a dressing!? All I can say is you have to try it before you diss it. 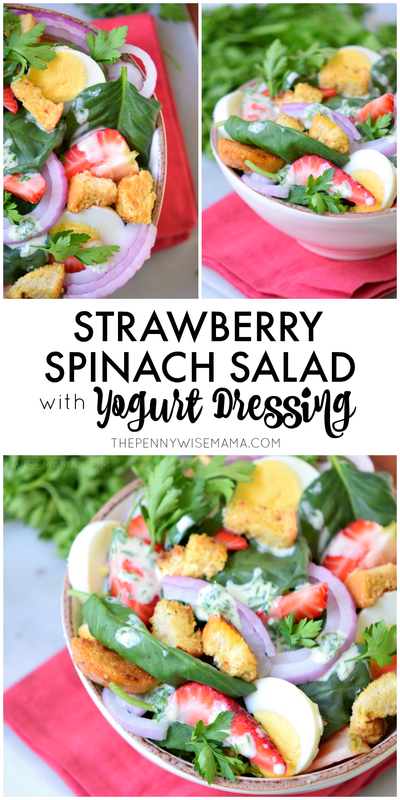 The yogurt dressing is creamy and incredibly delicious (tastes way better than the mayo based dressings) and it goes incredibly well with the spinach. 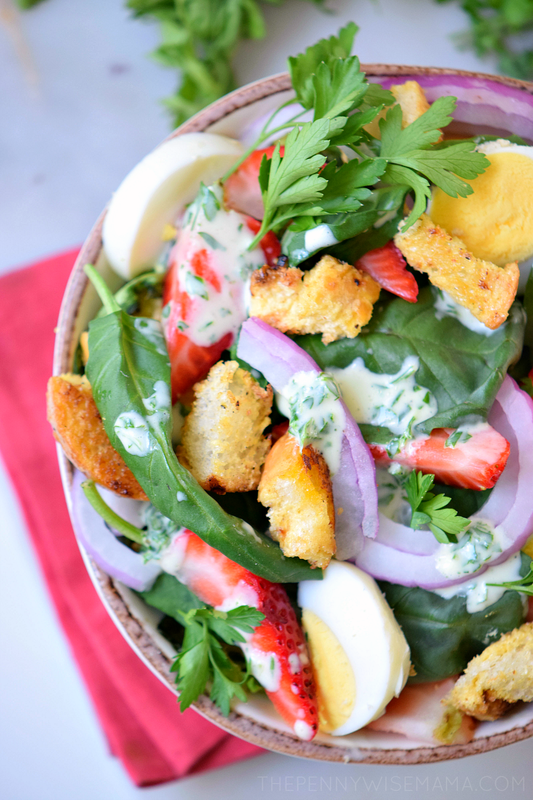 The strawberries add a nice freshness and the croutons give it an interesting crunch + a whole lot of flavor. 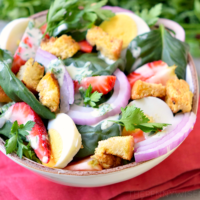 This Strawberry Spinach Salad featuring homemade Greek yogurt dressing is not only delicious and packed with flavor, it’s also healthy and super filling. Combine spinach leaves and half of the cilantro in a big bowl. 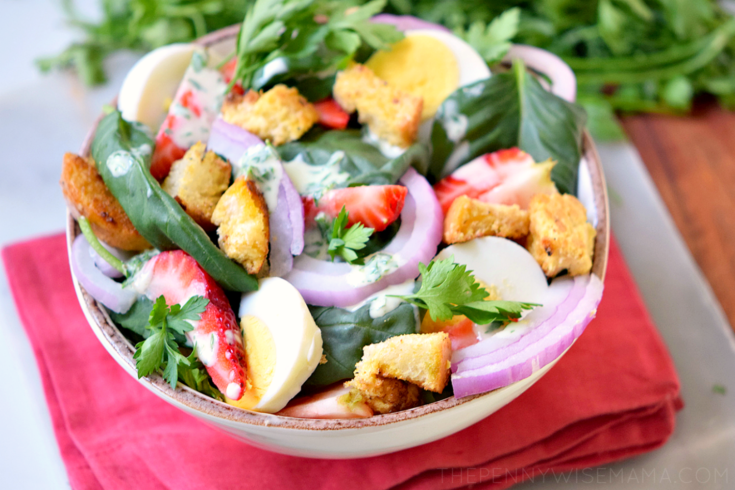 Slice the strawberries, red onion and boiled eggs. Add to the bowl, along with croutons, and set aside. Chop remaining cilantro leaves and place in small bowl. Add Greek yogurt and olive oil. Mix until well combined. Drizzle over the top of the salad. Tip: Make a big batch and keep it in the fridge for up to 4 days. When ready to serve, simply add in the dressing. As an added bonus, you can easily use this salad for meal prep. Just make a huge batch and then portion it out into containers for the week. 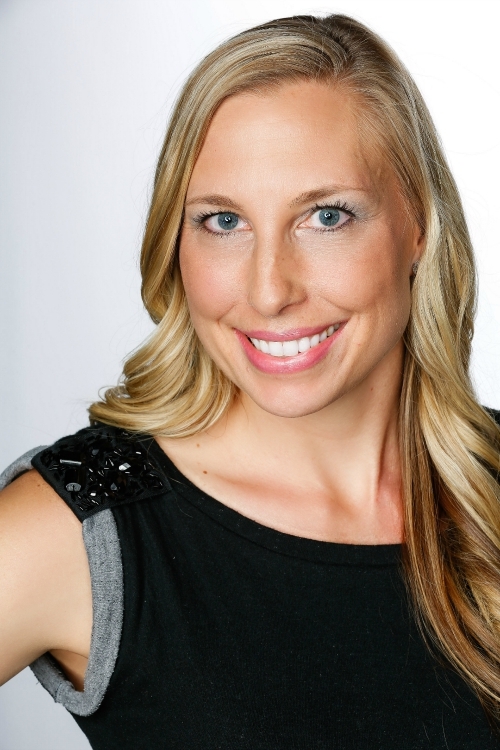 Talk about eating healthy even with a packed schedule! Just make sure you leave the dressing off until you are ready to eat it. I haven’t tried a salad like this in ages, and a yogurt dressing is new to me. I’d love to make this! I think it will be a big hit! I always make spinach salad with fresh strawberries. I would love to try the yogurt dressing! What a delicious, healthy, combination of flavors! This is a great idea. Thanks for the recipe! 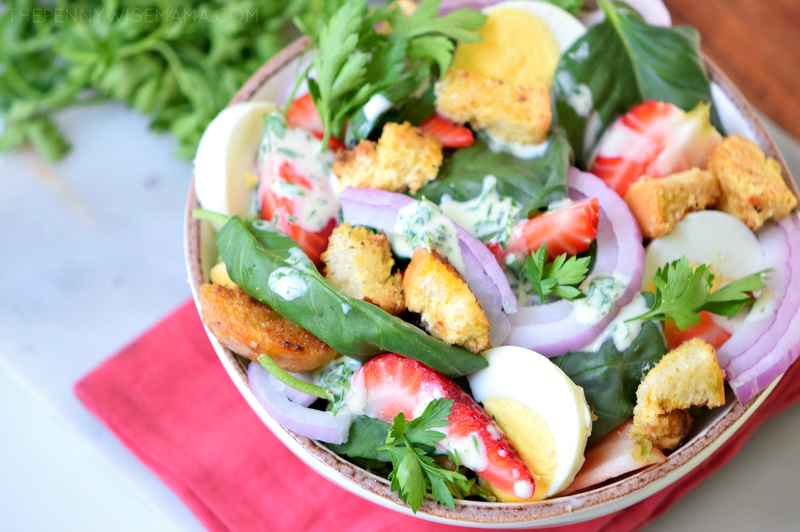 This looks so yummy and refreshing and a perfect dish for spring! This looks and sounds so good. I love the fresh fruit mixed in.. such a refreshing one for the warm weather! Also, those croutons look great! Your special salad recipes look especially yummy I will be making this over the coming weekend, it looks so delicious. This looks appetizing thanks for sharing this recipe. Looks healthy and delish! Yummm!